Dr. Shinichi Suzuki (1898 – 1998) was a Japanese humanitarian and philosopher. When approached by the parent of a 3-year-old after World War II about teaching the child to play the violin, Suzuki was hesitant. However, he had a revelation soon after: young children could be taught music in the same way they learned their native language, which all hearing children learn fluently. He called this “Talent Education.” The other main tenet of Suzuki’s philosophy is that EVERY child can learn. This is not just a more positive way of stating the recently popular mantra “no child left behind,” but goes much further. The private lesson instructor, parent, and student all work together from the understanding that all of them are committed to progress and successful mastery – no matter how small the steps, or quickly the progression. Encouragement in the learning progress is key, and comparative (and competitive) attitudes are discouraged. Each child will learn in their own unique way and time table, and it is the parent’s and teacher’s job to support their work with positive feedback before any needed correction takes place. Celebrating small steps may be a big deal! This method is one of great love, designed to nurture the children in an atmosphere of love and the building of self-confidence. As when a child learns to talk, parents are involved in the musical learning of their child. They attend lessons with the child and serve as “home teachers” during the week. Parents work with the teacher to create an enjoyable learning environment. 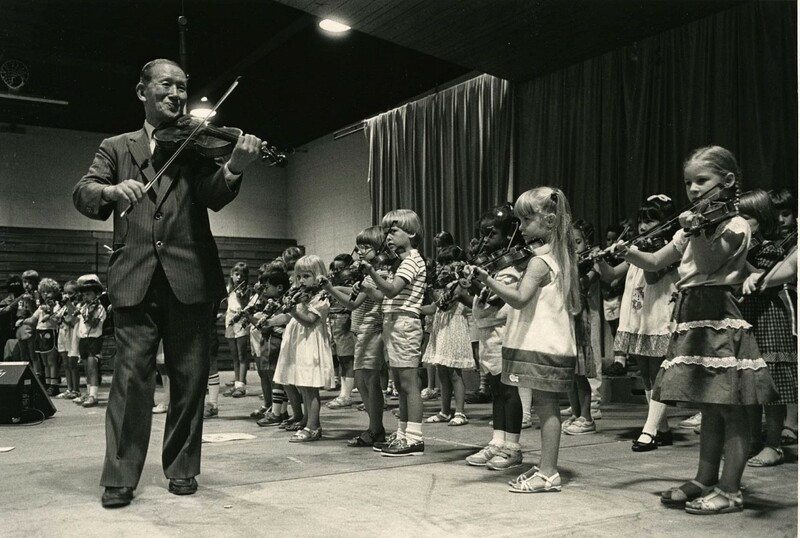 Now more commonly referred to as the “Suzuki method,” Talent Education begins each student as young as possible. A child learns to speak by listening to and mimicking sounds their parents and others in the home make. Similarly, Suzuki students listen to the CDs of the pieces they will learn (multiple times) every day. As they begin to master the mechanics of playing their instrument, the child learns to imitate the sounds on the recording. This builds pitch memory, allows the student to play complex pieces as well as folk songs without needing to read music, and results in a beautiful, rich tone. Each step to playing an instrument is approached with creative repetition and encouragement. The parent is an essential part of this learning process because they practice with the child every day – the teacher only sees them once or twice a week! Just as a child is encouraged to say a word over and over until it is mastered, so the student must repeat each activity or song until it is fluent. Once learned, each piece is reviewed constantly so that the student reinforces memory, technical skill, and musical expression. This is how Suzuki students are ready for a performance at any time. While learning a new skill, the teacher will give the parent and child games or challenges to complete at home every day focusing on that new skill. Parents often find a way to show their own creative genius too! 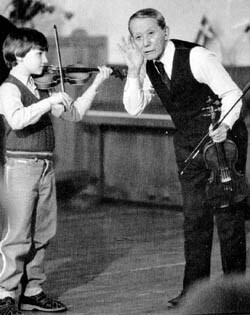 Although Suzuki students learn to play by ear, Dr. Suzuki recognized that music reading is also an important part of training. Just as we don’t expect our children to read books to us until they can speak fluently, we don’t expect students to be able to read music notes on a page while playing until they have mastered basic posture and technique. Don’t let that fool you, though. Every student learns the musical alphabet and the symbols on the music staff, as well as various rhythmic patterns, separately from their instrument from early stages. We call this music theory. As the child progresses toward music reading with their instrument, they learn more in-depth meaning of what they see on the page. Dr. Suzuki and several others have written helpful literature explaining his philosophy and helping parents: Nurtured by Love (Dr. Suzuki), Ability Development from Age Zero (Dr. Suzuki), To Learn with Love (William & Constance Starr), and Teaching from the Balance Point (Ed Kreitman). For additional information, FAQs, and a video on Dr. Suzuki’s philosophy and method, please see the Suzuki Association of the Americas’ website here. To strive for excellence in musical technique by following a carefully designed sequence of learning steps that has been successful in Japan, the Americas, and all over the world. To contribute to the overall development of accomplished men and women. To promote peace, unity, mutual respect, and love in our modern world through the common language of beautiful music.